My brother took this picture in New Zealand. Thanks for stopping by! Thank God for seeing us through another year. I wish you a very Happy and Blessed New Year in advance. ♥ I thank God for His goodness and mercies to me in this year. I have experienced God's abundant love and mercies in many wonderful ways that I don't know how to describe with Words! This year has been a very challenging year for me in health, work, some family matters and as I serve our Lord in my various callings. I thank God for His many grace and mercies as He has seen me through all the ups and downs in this year and works all things for His glory and my good. ♥ I thank God that we are more than conquerors through Him Who loves us! No matter what we go through, His grace is sufficient for us. He is faithful and full of loving kindness. I praise and thank Him for His graciousness to me despite my many failings. I know I shall continue to praise and thank Him in the year ahead because His compassion fails not and His mercies are new every morning. And He is the same yesterday, today and for ever! May this be your blessed experience too! May you too continue to be more than a conqueror through Him Who loves you! ♥ I thank God for restoring Madam TAM whom I shared with you previously. She is 83 years old and attends my church's evening service whenever she can. She has heart failure and recently suffered a fall. She was hospitalised for 2 months. Thank God that she is well enough to return home now though still recovering. May God continue to be merciful to her soul that she may know more and more of His love, mercies and comfort as she waits upon Him. Thank you very much for your prayers for her! Please continue to pray that she may truly know the comfort and mercies of God in her evening years, and be enabled to put her complete trust in Him as her Saviour and Lord and experience the peace that passes all understanding which He alone can gives. ♥ I thank God for using various physical illnesses eg vertigo, asthma, cold and flu, knee pain and chronic fatigue, to help me to slow down and rest in Him from time to time. With bipolar disorder, whenever I am well, I am a little hypomanic. I am more creative and tend to do many things and take on more and more projects unknowingly, which then will lead to burn out and relapse of clinical depression. Thank God for using various physical illness to help me to slow down and pace myself so that I was preserved from relapse of clinical depression and able to walk with Him and serve Him in little ways. I thank God that His grace is sufficient for me and He hears and answers prayers in many wonderful ways. ♥ I thank God for the beauties of His creations and the joy He has given me in enjoying them and taking photographs of them. I thank God for giving me the joy too in making homemade gifts using these photographs. 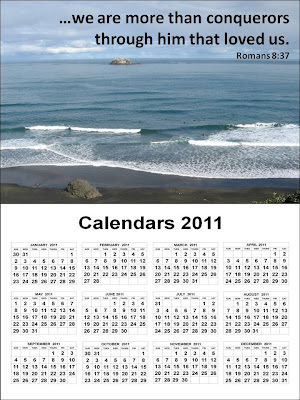 I have been making Free Calendars 2011, Free Homemade Bookmarks Handicrafts and Free Homemade Cards. 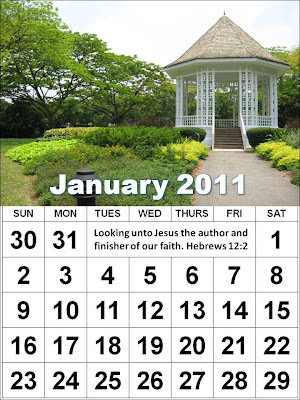 Do feel free to download the above calendar 2011 and also the following 12 monthly 2011 Calendars with encouraging Bible verses. 2) Go to the folder where you saved the picture and double click at the picture. Then print from there. 3) Or you can open any word processor program such as Microsoft Word or OpenOffice and insert the picture into it. Then you can format the size, etc, and print from there. 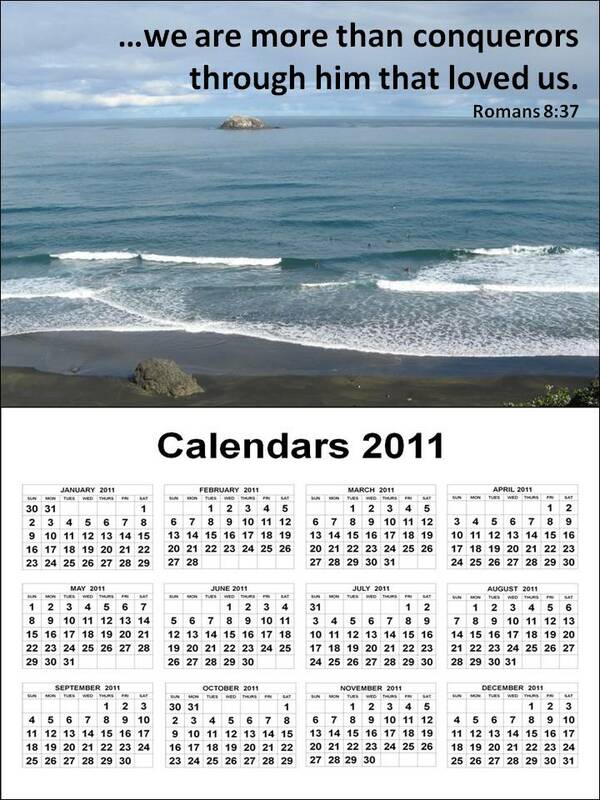 I made this monthly 2011 Calendar using the pictures my brother took in New Zealand. There are 12 pieces for the 12 months. 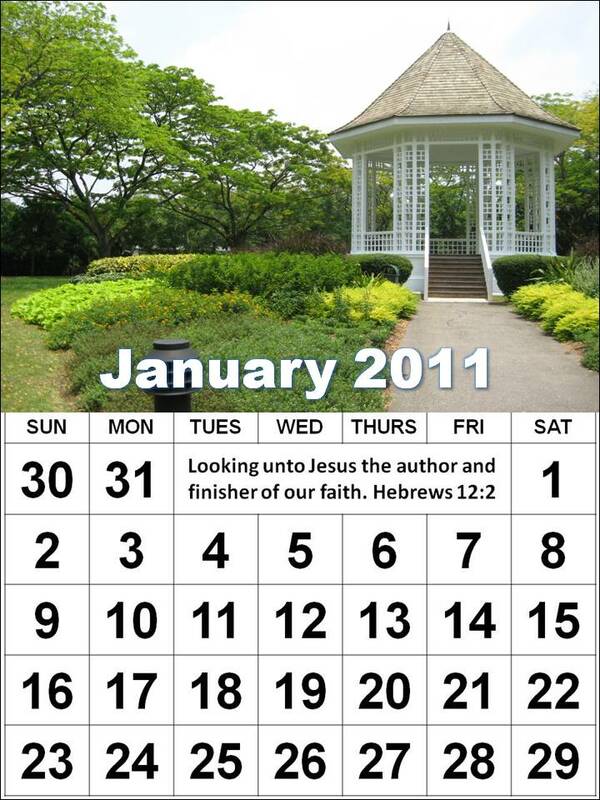 Feel free to download and make these calendars as gifts. To download all the 12 months, click here. I made this monthly 2011 Calendar using the pictures I took at Singapore Botanic Garden. There are 12 pieces for the 12 months. Feel free to download and make these calendars as gifts. ♥ I thank God for my family, my church, my friends and everyone of you, my dear blogging friends, and for your prayers and encouragements. They mean a lot to me and I thank God for every one of you. You have made a great difference in my life and used by God to encourage me and show me His love by your friendship and encouraging notes. You are in my thoughts and prayers too. Thank you for stopping by. Take care and have a blessed day and Blessed New Year ahead! Hello dear sister. I pray you are doing well. The calendars are lovely! Hi Nancie, So glad that you are able to see God's blessings, in spite of the many troubles you have seen this year. Isn't it something, to be able to be thankful for physical illness because it forces you to slow down! I pray that this year will be a good one for you. As stable as it can be, given our disorder. I pray that you will find lots of opportunity to serve God and to be blessed by that serving. Pace yourself, ok? As much as you are able. You are so wonderful! It's always refreshing to visit your blog. Happy Thankful Thursday! These are lovely! Well done! I hope you have a wonderful New Year. I'm looking forward to even greater blessings - the Lord's return is imminent and I just love how He's working in the hearts of others. I also love your testimony. I know a girl who says she has bipolar disorder, but she is cruel and hateful - not a believer. She says she can't help it because she has bipolar. You are a living testimony to the opposite. God has been so good to us this year! I praise Him for each time I join in and read everyone's thankful list, you all encourage me to press on as well! I'm blessed by what you've written, what a wonderful testimony of God's faithfulness, love and healing. May the Lord continue to bless your grateful heart. The calendar is beautiful too. You are always in my prayers and I hope 2011 will far surpass the love and blessings of 2010. Thank you for all your visits and encouraging words. I've been dealing with some health issues and not online much, which is ok.
Be of good cheer as our Lord will always be with us, no matter what! I think this is what sustains us. Love to you from Ks. Thanks for sharing your thankful heart, and an update. I hope you have a wonderful new year and I am grateful with you for God's blessings in 2010. Thanks for stopping by. It's so good to hear from you. I like the picture of Jack and your cat, Sylvia, that you post on your blog. So sweet to see both of them together in this way :) So glad you are continuing with your sewing. I hope you have a great week and a very God Blessed New Year Ahead. Thank you for stopping by my blog and for your prayers and encouragements. It is always so good to hear from you. Thank God for His goodness to us. Thank God for granting you rest and now renewing your strength. I like the quotation you shared on Jesus' answer. It is so true that in and of ourselves we will never be good enough for our Lord to display His radiant holiness. It is a mercy that He has chosen us, broken and weak vessels, to be instruments in His mighty Hands. It is often in our weaknesses that His Power is shown forth. He becomes very real to us and performs that which we are unable to do. This has been my blessed experience through this year and the years past too. I pray that our dear Lord Jesus Christ will continue to strengthen you day and day, guide you in His service, and bless you with great joy and peace as you walk with Him and serve Him in your various callings. May you continue to know His Power and Strength in your time of need. And may His love and faithfulness strengthen your hands and heart continuing. Thank you for stopping by my blog and your encouragement. It's so good to hear from you. Thank God for blessing you with such a wonderful husband. He is such a precious gift from God! May God continue to bless you and family in this new year. Thanks for stopping by my blog and your encouragement. It's so good to hear from you. May God bless you and family in this new year and continue to make you a blessing to others! Thanks for stopping by my blog and your lovely words of encouragements! It's so good to hear from you. Your handmade quilt is so lovely. Such a precious gift to your son. Truly though life is hard at times and God never promised that it would be easy, His promises to be with us and see us through comforts and strengthens our heart. I wish you and family a very blessed new year and may you continue to know God's love, peace and lovingkindness in this new year. Thanks for stopping by my blog. It's so good to hear from you. I too praise God for each time I join in Thankful Thursday and read everyone's thankful list as they encourage me to press on as well! Thank God for blessing you through many ways. May God continue to bless you and family in this new year. Happy New Year to you too! Indeed there is so much to be thankful for as God has shown us much grace and mercies through 2010. I am looking forward in this new year to walk closer with the Lord Jesus Christ and to serve Him wherever He leads me. I wish you a very blessed new year. May God continue to bless you in this new year. Take care! Blessed new year to you too! Thanks for stopping by my blog. It's so good to hear from you again. Thank you for all your visits and encouraging words too. I have not been able to blog actively too due to health and various reasons. I pray God will strengthen your health and bless you with many blessings in this new year. Truly God is good to us and we can rest in Him through all the changing scenes in life because He is with us and He see us safely through and works His ways wonderfully for us because He loves us dearly. Take care! Thanks for stopping by my blog. It's so good to hear from you. Thank you for sharing your thankful heart too. Thank God for blessing you in many wonderful ways with His presence and love. Truly this is not our home and I am looking forward too to the day when I can be with our Lord to enjoy His love and fellowship forever when my work assigned by Him is completed here. What a blessed hope! Meanwhile, it is a great encouragement indeed that He is with us and will never leave us nor forsake us. He is working all things for His glory and our good through all the changing scenes in life. I wish you a very blessed new year and may God continue to bless you and family in this new year with His love, peace, joy and many blessings. Take care!